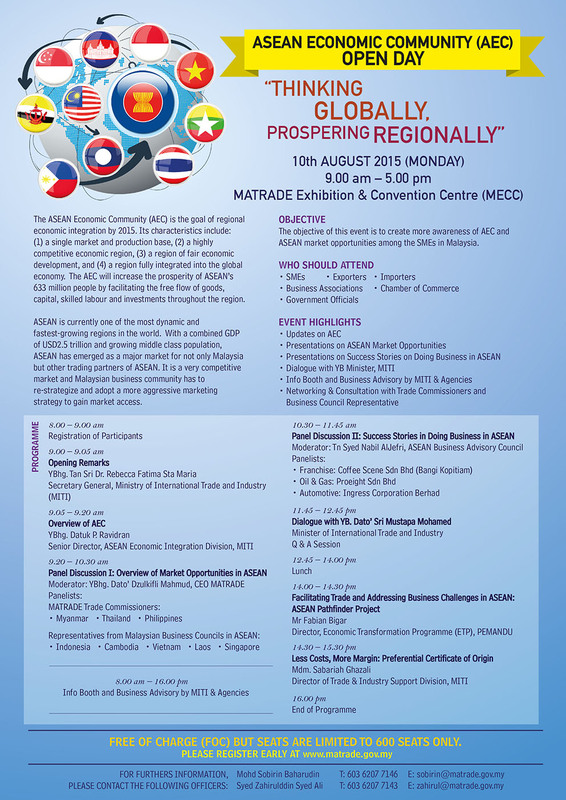 Please be informed that MALAYSIA EXTERNAL TRADE DEVELOPMENT CORPORATION (MATRADE) would like to invite you to participate in the ASEAN Economic Community (AEC) Open Day on 10th Aug 2015 (Monday). The event will be officiated by YBhg. Tan Sri Dr Rebecca Fatima Sta Maria, Secretary General of Ministry of International Trade and Industry (MITI). The event will be a good platform for SMEs to gain better understanding of the challenges ahead and opportunities under ASEAN Economic Community (AEC). The objective of this event is to create more awareness of AEC and ASEAN market opportunities among the SMEs in Malaysia. Speakers for this event are MATRADE Trade Commissioners and representatives from Malaysian Business Councils in the respective ASEAN countries. Selected Malaysian companies were also invited to share their success stories at this event.